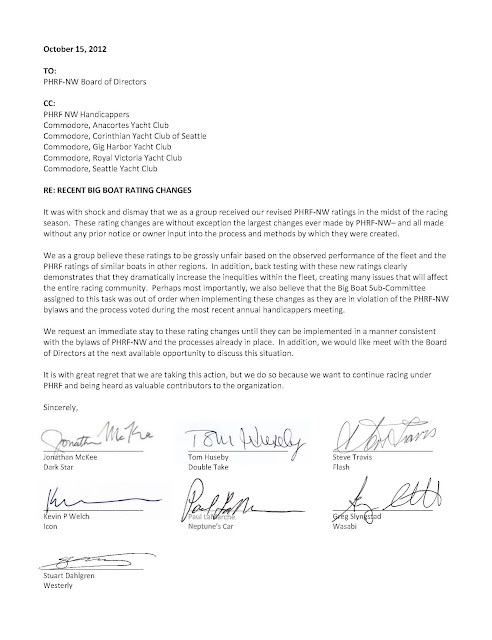 If you hadn't heard many of the owners of the big boat fleet are really upset with the recent unilateral rating changes imposed by a sub-committee of the PHRF-NW handicappers. These changes represent the largest set of rating changes EVER made in PHRF-NW history (30-40 seconds/mile) -- and done so without any owner input or feedback and using an unapproved methodology. Essentially what this sub-committee has done is come up with their own method of converting the ORR rating of a few selected boats back to PHRF using their own wind matrix and magic formula, such that their reference boat (J-160) came out with a rating of zero (0). They then simply guessed at the rating of the remaining boats. They then said live with the rating for a year and come back with an appeal if you don't like it. The very premise of this approach is fundamentally flawed -- you cannot take a non-linear measurement based VPP system and convert it to an observed performance rating system like PHRF. When you do (as they have done) you end up with a totally absurd set of ratings which result in most boats being completely out of line with their comparable PHRF rating in other regions of the country. In addition, this methodology was only applied to a portion of the fleet (ignoring those rated slower than zero and the multi-hulls) and without any back-testing.